Question: What Do I Need to Start Up My Pool? Question: When Should We Test Our Pool Water? Regular pool water testing makes it EASY to keep pool water crystal clear, safe and enjoyable! Simple, easy and highly affordable make pool water testing about as convenient as possible. 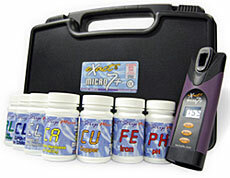 Traditional 'wet' chemistry pool water test kits use liquids, powders, tablets, etc. Recently developed pool water testing meters take all the guesswork out of pool water testing.